Hyperloop One, a futuristic transportation company, announced on Wednesday that the location of its first Hyperloop manufacturing plant is in North Las Vegas. 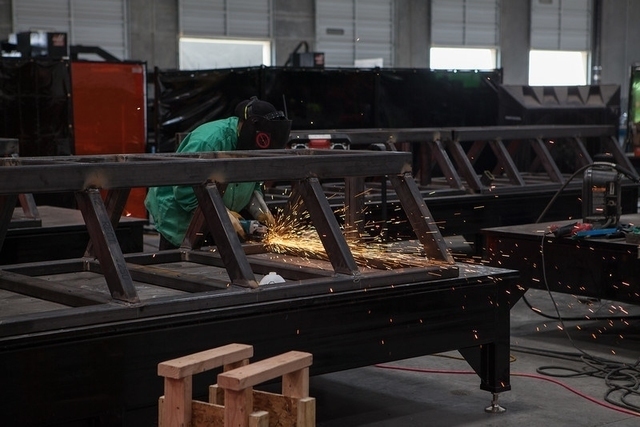 Engineers and welders at Hyperloop One Metalworks, a 105,000 square-foot tooling and fabrication plant in North Las Vegas, will build and test parts of DevLoop, the first prototype of a transportation system that promises to whisk people and cargo through metal tubes at speeds of more than 700 mph. “The Hyperloop One Metalworks tooling and fabrication plant provides Hyperloop One with an incredible facility that will allow us to build and develop DevLoop by early 2017,” Rob Lloyd, CEO of Hyperloop One, said in a statement. The site will also house a Transponics test lab that will advance work on the propulsion system that launches the vessel at high speeds. The Los Angeles-based company was co-founded by venture capitalist Shervin Pishevar, an early investor in Uber and has 170 total employees. In December, the company chose Nevada to build an open-air track to test the system. After a successful open-air test at its Apex industrial park project site in May, the company said it would expand to 50 to 65 Nevada employees. Also in May, the company changed its name from Hyperloop Technologies and announced that it had closed $80 million in new financing for future projects. If successful, the futuristic transit system could eventually compete with airlines and trucks for passengers and cargo. Lloyd has said he expects the company to begin transporting cargo by 2019 and transporting passengers by 2021. Earlier this month, co-founder Brogan BamBrogan filed a lawsuit against Hyperloop One, Pishevar, and others for wrongful termination and breach of contract, among other charges. The company has since filed a countersuit, claiming that BamBrogan was part of a group of employees that engaged in misconduct. The idea for Hyperloop was open-sourced by billionaire and technology innovator Elon Musk.